This article is about the U.S. federal law. For freedom of information in the fifty U.S. states, see Freedom of information in the United States. As indicated by its long title, FOIA was actually extracted from its original home in Section 3 of the Administrative Procedure Act (APA). Section 3 of the APA, as enacted in 1946, gave agencies broad discretion concerning the publication of governmental records. Following concerns that the provision had become more of a withholding than a disclosure mechanism, Congress amended the section in 1966 as a standalone act to implement "a general philosophy of full agency disclosure." The amendment required agencies to publish their rules of procedure in the Federal Register, 5 U.S.C. �� 552(a)(1)(C), and to make available for public inspection and copying their opinions, statements of policy, interpretations, and staff manuals and instructions that are not already published in the Federal Register, § 552(a)(2). In addition, § 522(a)(3) requires every agency, "upon any request for records which ... reasonably describes such records" to make such records "promptly available to any person." If an agency improperly withholds any documents, the district court has jurisdiction to order their production. Unlike the review of other agency action that must be upheld if supported by substantial evidence and not arbitrary or capricious, FOIA expressly places the burden "on the agency to sustain its action," and directs the district courts to "determine the matter de novo." The federal government's Freedom of Information Act should not be confused with the different and varying freedom of information law enacted by the individual states. With the ongoing stress on both constitutional and inherent rights of American citizens and the added assertion of government subservience to the individual, some, particularly representative John Moss, thought that it was necessary for government information to be available to the public. This push built on existing principles and protocols of government administration already in place. Others, though—most notably President Lyndon B. Johnson—believed that certain types of unclassified government information should nonetheless remain secret. Notwithstanding the White House's opposition, Congress expanded Section 3 of the Administrative Procedure Act as a standalone measure in 1966 to further standardize the publication of government records, consistent with the belief that the people have the "right to know" about them. The Privacy Act of 1974 was passed as a countervailing measure to ensure the security of government documents increasingly kept on private citizens. geological and geophysical information and data, including maps, concerning wells. The Postal Reorganization Act of 1970 (at 39 U.S.C. § 410(c)(2)) exempts the United States Postal Service (USPS) from disclosure of "information of a commercial nature, including trade secrets, whether or not obtained from a person outside the Postal Service, which under good business practice would not be publicly disclosed". The law came about because of the determination of United States House of Representatives member John E. Moss of California. Moss was chairman of the House Government Information Subcommittee. It took Moss 12 years to get the Freedom of Information Act through Congress. Much of the desire for government transparency stemmed from the Department of Defense and Congressional committees evaluation of the nation's classification system in the late 1950s. They determined that the misuse of government classification of documents was causing insiders to leak documents that were marked "confidential." The committee also determined that the lowest rung of the confidentiality ladder "confidential" should be removed. They deemed that "secret" and "top secret" covered National security adequately. The Moss Committee took it upon itself to reform confidentiality policy and implement punishments for the overuse of classification by officials and departments. The FOIA has been changed repeatedly by both the legislative and executive branches. The Freedom of Information Act was initially introduced as the bill S. 1160 in the 89th Congress. When the two-page bill was signed into law it became Pub.L. 89–487, 80 Stat. 250, enacted July 4, 1966, but had an effective date of one year after the date of enactment, or July 4, 1967. The law set up the structure of FOIA as we know it today. That law was initially repealed. During the period between the enactment of the act and its effective date, Title 5 of the United States Code was enacted into positive law. For reasons now unclear but which may have had to do with the way the enactment of Title 5 changed how the law being amended was supposed to be cited, the original Freedom of Information Act was replaced. A new act in Pub.L. 90–23, 81 Stat. 54, enacted June 5, 1967 (originally H.R. 5357 in the 90th Congress), repealed the original and put in its place a substantively identical law. This statute was signed on June 5, 1967, and had the same effective date as the original statute: July 4, 1967. Scalia remained highly critical of the 1974 amendments, writing years later that "It is the Taj Mahal of the Doctrine of Unanticipated Consequences, the Sistine Chapel of Cost-Benefit Analysis Ignored." Scalia particularly disliked the availability of judicial review, decrying that if "an agency denies a freedom of information request, shazam!—the full force of the Third Branch of the government is summoned to the wronged party's assistance." These amendments that these FOIA regulate government control of documents which concern a citizen. It gives one "(1) the right to see records about [one]self, subject to the Privacy Act's exemptions, (2) the right to amend that record if it is inaccurate, irrelevant, untimely, or incomplete, and (3) the right to sue the government for violations of the statute including permitting others to see [one's] records unless specifically permitted by the Act." In conjunction with the FOIA, the PA is used to further the rights of an individual gaining access to information held by the government. The Justice Department's Office of Information and Privacy and federal district courts are the two channels of appeal available to seekers of information. Related to the agency's participation in legal proceedings. Between 1982 and 1995, President Reagan's Executive Order 12356 allowed federal agencies to withhold enormous amounts of information under Exemption 1(relating to national security information), claiming it would better protect the country and strengthen national security. The outcry from the effect that the Reagan Order had on FOIA requests was a factor in leading President Clinton to dramatically alter the criteria in 1995. The FOIA amendments were a small part of the bipartisan Anti-Drug Abuse Act of 1986. Congress amended FOIA to address the fees charged by different categories of requesters and the scope of access to law enforcement and national security records. The amendments are not referenced in the congressional reports on the Act, so the floor statements provide an indication of Congressional intent. Between 1995 and 1999, President Clinton issued executive directives (and amendments to the directives) that allowed the release of previously classified national security documents more than 25 years old and of historical interest, as part of the FOIA. This release of information allowed many previously publicly unknown details about the Cold War and other historical events to be discussed openly. The Electronic Freedom of Information Act Amendments of 1996 (E-FOIA) stated that all agencies are required by statute to make certain types of records, created by the agency on or after November 1, 1996, available electronically. Agencies must also provide electronic reading rooms for citizens to use to have access to records. Given the large volume of records and limited resources, the amendment also extended the agencies' required response time to FOIA requests. Formerly, the response time was ten days and the amendment extended it to twenty business days. Executive Order 13233, drafted by Alberto R. Gonzales and issued by President George W. Bush on November 1, 2001, restricted access to the records of former presidents. This order was revoked on January 21, 2009, as part of President Barack Obama's Executive Order 13489. Public access to presidential records was restored to the original extent of five years (12 for some records) outlined in the Presidential Records Act. In effect, this new language precluded any covered U.S. intelligence agency from disclosing records in response to FOIA requests made by foreign governments or international governmental organizations. By its terms, it prohibits disclosure in response to requests made by such non-U.S. governmental entities either directly or through a "representative". This means that for any FOIA request that by its nature appears as if it might have been made by or on behalf of a non-U.S. governmental entity, a covered agency may inquire into the particular circumstances of the requester in order to properly implement this new FOIA provision. The agencies affected by this amendment are those that are part of, or contain "an element of", the "intelligence community". As defined in the National Security Act of 1947 (as amended), they consist of the CIA, the National Security Agency, the Defense Intelligence Agency, the National Imagery and Mapping Agency, the National Reconnaissance Office (and certain other reconnaissance offices within the Department of Defense), the intelligence elements of the Army, the Navy, the Air Force, and the Marine Corps, the FBI, the Department of the Treasury, the Department of Energy, and the Coast Guard, the Department of Homeland Security, the Bureau of Intelligence and Research in the Department of State, and "such other elements of any other department or agency as may be designated by the President, or designated jointly by the Director of Central Intelligence and the head of the department or agency concerned, as an element of the intelligence community". establishing a definition of "a representative of the news media;"
establishing an Office of Government Information Services (OGIS) in the National Archives and Records Administration to review agency compliance with FOIA. it recognizes electronic media specifically and defines "News Media" as "any person or entity that gathers information of potential interest to a segment of the public, uses its editorial skills to turn the raw materials into a distinct work, and distributes that work to an audience." it extends the 20-day deadline by allowing for up to 10 days between the FOIA office of the agency and the component of the agency holding the records and specifically allows for clarification of requests by the FOIA office (Effective 12/31/2007). it calls for each agency to designate a FOIA Public Liaison, "who shall assist in the resolution of any disputes" (Effective 12/31/2008). it requires agencies to assign tracking numbers to FOIA requests that take longer than 10 days, and to provide systems determining the status of a request. it codifies and defines annual reporting requirements for each agency's FOIA program. it specifically addresses data sources used to generate reports; "shall make the raw statistical data used in its reports available electronically ..."
it redefines the definition of an agency "record" to include information held for an agency by a government contractor. it establishes an Office of Government Information Services (OGIS) which will offer mediation services to resolve disputes as non-exclusive alternative to litigation. it requires agencies to make recommendations personnel matters related to FOIA such as whether FOIA performance should be used as a merit factor. it requires agencies to specify the specific exemption for each deletion or redaction in disclosed documents. On December 29, 2009, President Barack Obama issued Executive Order 13526, which allows the government to classify certain specific types of information relevant to national security after it has been requested. That is, a request for information that meets the criteria for availability under FOIA can still be denied if the government determines that the information should have been classified, and unavailable. It also sets a timeline for automatic declassification of old information that is not specifically identified as requiring continued secrecy. The Dodd–Frank Wall Street Reform and Consumer Protection Act, signed into law in July 2010, included provisions in section 929I that shielded the Securities and Exchange Commission (SEC) from requests under the Freedom of Information Act. The provisions were initially motivated out of concern that the FOIA would hinder SEC investigations that involved trade secrets of financial companies, including "watch lists" they gathered about other companies, trading records of investment managers, and "trading algorithms" used by investment firms. In September 2010, the 111th Congress passed an act repealing those provisions. The act was introduced in the Senate on August 5, 2010 as S.3717 and given the name "A bill to amend the Securities Exchange Act of 1934, the Investment Company Act of 1940, and the Investment Advisers Act of 1940 to provide for certain disclosures under section 552 of title 5, United States Code, (commonly referred to as the Freedom of Information Act), and for other purposes." A major issue in released documentation is government "redaction" of certain passages deemed applicable to the Exemption section of the FOIA. Federal Bureau of Investigation (FBI) officers in charge of responding to FOIA requests "so heavily redacted the released records as to preclude needed research." This has also brought into question just how one can verify that they have been given complete records in response to a request. Freedom of Information Act requests have led to the release of information such as this letter by J. Edgar Hoover about surveillance of ex-Beatle John Lennon. A 25-year battle by historian Jon Wiener based on FOIA, with the assistance of lawyers from the ACLU, eventually resulted in the release of documents like this one. 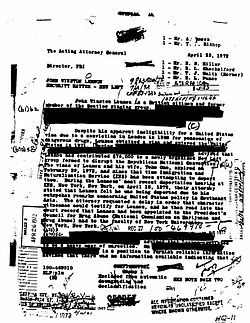 This trend of unwillingness to release records was especially evident in the process of making public the FBI files on J. Edgar Hoover. Of the 164 files and about eighteen thousand pages collected by the FBI, two-thirds were withheld from Athan G. Theoharis and plaintiff, most notably one entire folder entitled the "White House Security Survey." Despite finding out that the Truman Library had an accessible file which documented all the reports of this folder, the FBI and Office of Information and Privacy put forth "stony resistance" to the FOIA appeal process. (I–pg. 27) Some[who?] argue that it was not even this sixteen year series of three appeals to the Justice Department which gained a further opening of the files, but rather the case of Department of Justice v. Landano which spurred on a break in stolid FBI opposition. A murder trial decided in 1993, Department of Justice v. Landano, 508 U.S. 165 (1993), involved what was alleged to be a felony murder committed during a group burglary by defendant Landano. Justice Sandra Day O'Connor wrote the unanimous opinion. "In an effort to support his claim in subsequent state court proceedings that the prosecution violated Brady v. Maryland, 373 U.S. 83 (1963), by withholding material exculpatory evidence, he filed Freedom of Information Act (FOIA) requests with the FBI for information it had compiled in connection with the murder investigation." In defense, the FBI put forth a claim that the redacted sections of the documents requested were withheld in accordance with FOIA regulations protecting the identity of informants who gave information regarding case details. However, O'Connor ruled that those who supplied information had no need to remain anonymous in the court setting. "To the extent that the Government's proof may compromise legitimate interests, the Government still can attempt to meet its burden with in camera affidavits." The court thus remanded the case to the Circuit Courts and rejected the FBI's claim of confidentiality as being a valid reason to withhold information. "While most individual sources may expect confidentiality, the Government offers no explanation, other than administrative ease, why that expectation always should be presumed." Thus, when Theoharis and company were in the middle of fighting in court to obtain J. Edgar Hoover files, they may well have benefited from Landano and also Janet Reno's assertions of the government's need for "greater openness" and "discretionary releases" in 1993. In the case of Scott Armstrong v. Executive Office of the President, et al., the White House used the PROFS computer communications software. With encryption designed for secure messaging, PROFS notes concerning the Iran–Contra affair (arms-for-hostages) under the Reagan Administration were insulated. However, they were also backed up and transferred to paper memos. The National Security Council, on the eve of President George H.W. Bush's inauguration, planned to destroy these records. The National Security Archive, Armstrong's association for the preservation of government historical documents, obtained an injunction in Federal District Court against the head, John Fawcett, of the National Archives and Records Administration and the National Security Council's purging of PROFS records. A Temporary Restraining Order was approved by Senior U.S. District Court Judge Barrington D. Parker. Suit was filed at District Court under Judge Richey, who upheld the injunction of PROFS records. Richey gave a further injunction to prevent a purging of the George H.W. Bush's administration's records as well. On counts of leaving the White House clean for the new Clinton Administration, the Bush group appealed but was denied its request. Finally, the Clinton Administration appealed to the U.S. Court of Appeals, stating that the National Security Council was not truly an agency but a group of aides to the President and thus not subject to FOIA regulations. Under the Presidential Records Act, "FOIA requests for NSC [could] not be filed until five years after the president ha[d] left office ... or twelve years if the records [were] classified." The Clinton administration won, and the National Security Archive was not granted a writ of certiorari by the Supreme Court on these grounds. According to Scott Armstrong, taking into account labor and material costs, the three presidential administrations spent almost $9.3 million on contesting the National Security Archive FOIA requests for PROFS e-mail records. In the latest analysis published in 2015 (using 2012 and 2013 data, the most recent years available) ten of the 15 did not earn satisfactory overall grades, scoring less than 70 out of a possible 100 points. Eight of the ten earned Ds, including the Department of Homeland Security (69 percent), Department of Transportation (68 percent), United States Department of the Treasury (Treasury) (68 percent), the Environmental Protection Agency (EPA) (67 percent), the United States Department of Labor (63 percent), the United States Department of Veterans Affairs (64 percent), the United States Department of Defense (61 percent), the Securities and Exchange Commission (61 percent). The Department of Health and Human Services and the Department of State earned an F. The State Department's score (37 percent) was dismal due to its extremely low processing score of 23 percent, which was completely out of line with any other agency's performance. Scores of five agencies, the Equal Employment Opportunity Commission, the Department of Health and Human Services, the SEC, the DOJ, and the EPA, even decreased marginally. ^ Branscomb, Anne (1994). Who Owns Information? : From Privacy To Public Access. BasicBooks. ^ "FOIA Legislative History". The National Security Archive. The National Security Archive. Retrieved 24 September 2013. ^ Gerhard Peters and John T. Woolley. "Lyndon B. Johnson: "Statement by the President Upon Signing the "Freedom of Information Act. ", July 4, 1966". The American Presidency Project. The American Presidency Project. Retrieved 24 September 2013. ^ Metcalfe, Daniel J. (23 May 2006). The Presidential Executive Order on the Freedom of Information Act (PDF). 4th International Conference of Information Commissioners. pp. 54–74. Archived from the original (PDF) on 2011-10-18. Retrieved 20 June 2013. ^ a b Office of Information and Privacy (OIP) (2005-10-10). "U.S. Department of Justice Freedom of Information Act (FOIA) General Information". Retrieved 2010-01-03. ^ a b "FOIA Update: The Freedom of Information Act, 5 U.S.C. sect. 552, As Amended By Public Law No. 104-231, 110 Stat. 3048". Office of Information and Privacy, U.S. Department of Justice. ^ "AO-04-14". Virginia.gov. 22 May 2014. further records were denied pursuant to the criminal investigative files exemption, subdivision A 2 a of § 2.2-3706. ^ "February 14: For the love of ..." issuu.com. 13 February 2018. Alan Gernhardt at the Virginia Freedom of Information Advisory Council says the videos could fall under FOIA's criminal investigative files exemption, especially if they were shown at a preliminary hearing. ^ "USPS: ZIP Codes are "Commercially Sensitive" Trade Secrets". The WebLaws.org Blog. November 6, 2013. Retrieved 7 November 2013. ^ a b Gold, Susan Dudley. 2012. Freedom of Information Act. New York, NY: Marshall Cavendish Benchmark. ^ The enactment of Title 5 into positive law was done by Pub.L. 89–554, 80 Stat. 378, enacted September 6, 1966. This means that while Title 5 existed before, it was merely a compilation of laws but not the law itself. Only about half of the U.S. Code is positive law, meaning the law itself. See uscode.house.gov for background on positive law codifiation of the U.S. Code. ^ a b c d "Veto Battle 30 Years Ago Set Freedom of Information Norms: Scalia, Rumsfeld, Cheney Opposed Open Government Bill; Congress Overrode President Ford's Veto of Court Review". Electronic Briefing Book No. 142. National Security Archive (George Washington University, Washington, D.C.). 2004-11-23. ^ Memorandum for President Ford from Ken Cole, "H.R. 12471, Amendments to the Freedom of Information Act," September 25, 1974 Source: Gerald R. Ford Library. Document 10. ^ a b Scalia, Antonin (March 1982). "The Freedom of Information Act Has No Clothes" (PDF). Regulation. 6 (2): 14. Retrieved 10 June 2016. ^ Your Right to Federal Records: Questions and Answers on the Freedom of Information Act and the Privacy Act. Electronic Privacy Information Center. 1992. ^ a b c Theoharis, Athan (1998). A Culture of Secrecy: The Government Versus the People's Right to Know. Kansas: University Press of Kansas. p. 27. ^ a b "Brief Amici Curiae of The Reporters Committee for Freedom of the Press and the Society of Professional Journalists in support of Leslie R. Weatherhead, Respondent". United States of America, United States Department of Justice, and United States Department of State, Petitioners, v. Leslie R. Weatherhead, Respondent, in the Supreme Court of the United States. 1999-11-19. ^ "FOIA Reform Legislation Enacted: FOIA Update Vol. VII, No. 4". U.S. Department of Justice. 1986. ^ "Freedom of Information Act (FOIA)". Illinois Institute of Technology Paul V. Galvin Library. Archived from the original on 2002-06-02. Retrieved 2002-06-04. ^ "Executive Order 13489 on Presidential Records". fas.org. ^ a b c "FOIA Post: FOIA Amended by Intelligence Authorization Act". United States Department of Justice Office of Information and Privacy. 2002. ^ Pub.L. 107–306, 116 Stat. 2383, § 312 (to be codified at 5 U.S.C. § 552(a)(3)(A), 5 U.S.C. § 552(a)(3)(E)). ^ "Public Law 110-175 OPENNESS PROMOTES EFFECTIVENESS IN OUR NATIONAL GOVERNMENT ACT OF 2007". Government Printing Office. 2007-12-31. Retrieved 2010-06-13. ^ a b "OGIS Home Page". National Archives and Records Administration. ^ "Executive Order 13526". Federation of American Scientists. ^ "House holds hearing on controversial SEC FOIA exemption". rcfp.org. ^ "Schapiro explains why some info should be secret". CNN. September 16, 2010. ^ a b United States Dep't of Justice v. Landano, 373 U.S. 83 (1963). ^ Theoharis (1998), pp. 151–152. ^ Theoharis (1998), p. 156. ^ Theoharis (1998), p. 159. ^ a b Gillum, Jack (4 June 2013). "TOP OBAMA APPOINTEES USING SECRET EMAIL ACCOUNTS". The Associated Press. Archived from the original on 2013-10-07. Retrieved 24 September 2013. ^ "US officials found to be using secret government email accounts". The Guardian. The Associated Press. 4 June 2013. Retrieved 24 September 2013. ^ a b Woolery, Liz (14 June 2013). "'Secret' Email Accounts Raise More Questions, Concerns About Government Transparency". Chilling Effects Clearinghouse. Archived from the original on 2013-07-20. Retrieved 24 September 2013. ^ "While US Attorney General, Eric Holder Used Kareem Abdul-Jabbar's Birth Name as His Official Email Address". VICE News. Retrieved 2016-02-27. ^ "DEA wants $1.4 million before it will begin processing request". MuckRock. Retrieved 2016-02-13. ^ "The Pentagon's $660 million FOIA fee". MuckRock. Retrieved 2016-02-27. Stanford Libraries FOIA archive – Preserved collection of sites that deal with Freedom of Information Act (FOIA) requests and documents. This includes government sites that receive and distribute FOIA documents (aka "FOIA reading rooms") as well as non-profit organizations and government watchdogs that request large numbers of FOIA documents on specific topics like national security and civil rights. "Freedom of Information Act". Amend section 3 of the Administrative Procedure Act. Enrolled Acts and Resolutions of Congress, compiled 1789–2008. U.S. National Archives and Records Administration. July 4, 1966. Peters, Gerhard; Woolley, John T (July 4, 1966). "Statement by the President Upon Signing the "Freedom of Information Act."". The American Presidency Project. University of California – Santa Barbara. "Want to Obtain FBI Records a Little Quicker? Try New eFOIA System". FBI. November 30, 2015. Archived from the original on December 8, 2015.